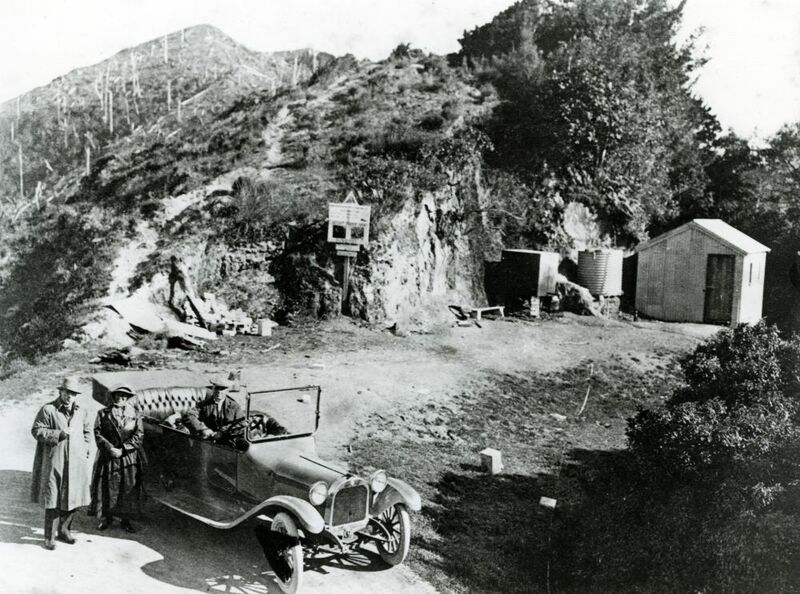 The Rimutaka Summit in 1917. Sir Ernest Shackleton (left) was driving to the Wairarapa on a lecture tour. The small hut housed boilers for dispensing tea to troops marching over the Rimutaka Range. The summit of the Rimutaka Road (555m/1820 ft), between Upper Hutt and Featherston, was a stopping point for troops during their march from Featherston and Tauherenikau camps to Trentham Camp. Volunteers from Wairarapa Patriotic Association distributed food and drink to soldiers at the summit. A small hut was built to house water boilers for tea making. Between September 1915 and mid-1918 between 30-35,000 infantry marched from Featherston to Trentham in a training exercise over three days and two nights. The troops bivouacked at Kaitoke on the first night. The second night was at Maidstone Park, Upper Hutt, and included an early morning practice attack near Maymorn. The 7th Reinforcement, in camp at Tauherenikau, was the first marching group. Professional and amateur photographers recorded the marches, showing the men and their civilian supporters. Reinforcement marches were suspended in the winter of 1918. They were to be resumed in late 1918 but the influenza epidemic and the Armistice, both in November 1918, prevented resumption. The Rimutaka track was first cut in the 1850s, allowing transport access from Wellington to the Wairarapa Valley and its new settlements. By 1914 the road was a single-lane gravel road. Traffic was sparse as most passengers and freight used the Wellington-Wairarapa railway, part of which was the Rimutaka Incline utilising the Fell rail system.